risk factors in the development and progression of periodontal disease. Your periodontist, dentist, or dental hygienist will assess your risk factors for periodontal disease as part of the comprehensive periodontal evaluation. This will help better predict the likelihood that you will develop periodontal disease or that your condition will worsen. It will assist your periodontist or dentist in determining the best personalized course of treatment for you. 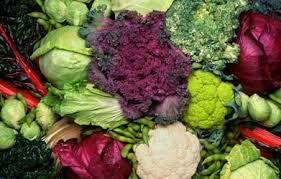 Read about the wonderful world of cruciferous vegetables! Since we know that periodontal disease is associated with many inflammatory systemic diseases and the evidence is incontrovertible that nutrition is a factor in prevention of disease; good nutrition is a benefit to your overall well-being. We thought we'd share this article about health and vegetables. Every day there are more articles published about nutrition and how it affects our health. So, let us introduce you to the world of cruciferous vegetables! Try brussel sprout chips. Remove the leaves from the base. Toss with olive oil and bake at 350 degrees F for about 20 minutes or until crispy, turning every 5 minutes. Researchers at Tel Aviv University (TAU) have found that oral tissue piercings fracture teeth and increase dental complications in early adulthood. (front) tooth loss later in life. Levin also stated that high rates of fractures due to piercings are not found in other age groups, and cases of severe periodontal damage in teens without oral piercings are similarly rare. Their earlier research was carried out on 400 young adults aged 18-19, but in their new study captures a larger area detailing the risks and complications of oral piercings, drawing on research from multiple centers in America and across the world. Levin said that 10 percent of all New York teenagers have some kind of oral piercings, compared to about 20 percent in Israel and 3.4 percent in Finland. He also warned the kids to think twice before getting an oral piercing, as it can lead to easily preventable health complications and, in some (rare) cases, even death. “There are short-term complications to piercings in low percentages of teens, and in rare cases a piercing to the oral cavity can cause death. Swelling and inflammation of the area can cause edema, which disturbs the respiratory tract,” he said. “There is a repeated trauma to the area of the gum. You can see these young men and women playing with the piercing on their tongue or lip. This act prolongs the trauma to the mouth and in many cases is a precursor to anterior tooth loss,” said Levin. In their Israel-based study, the researchers examined teens both with piercings and without, asking them a number of questions about their oral health, their knowledge of the risk factors associated with piercings, and about their piercing history, before conducting the clinical oral exams. However, he noted that those youngsters who opted for oral piercing were very concerned about body image, but seemed to be unaware of the future risks such piercings can cause. Bottom line, the best advice for teens is to “try and avoid getting your mouth pierced,” said co-investigator Dr. Yehuda Zadik.